On January 23, 1865, 150 years ago today, the Confederate James River Squadron was preparing for the sort of last ditch effort which can turn the tide of a campaign, if not a war. By January 1865, Ulysses S. Grant’s massive army group containing the Army of the James and the Army of the Potomac had one very specific supply dump, and its name was City Point. 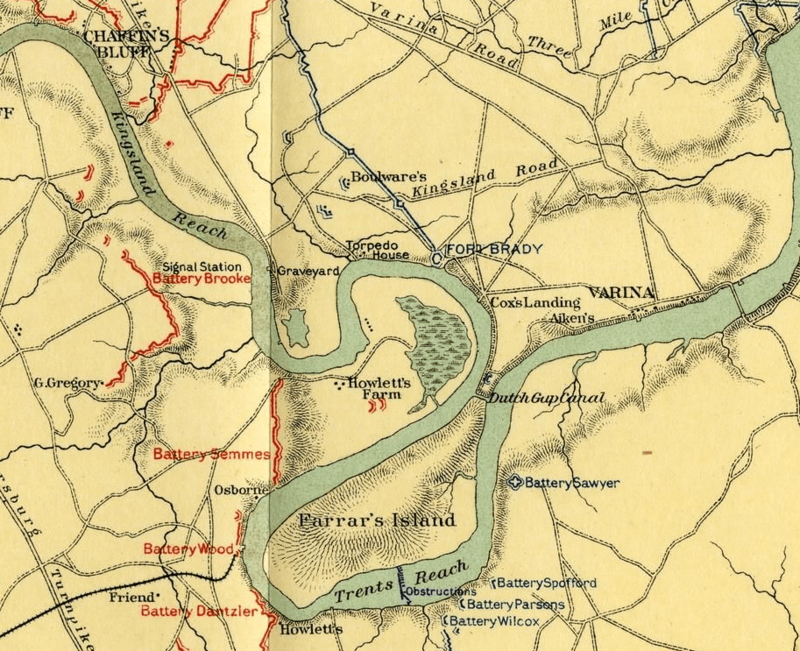 It was the nerve center of Grant’s army, centrally located southeast of Richmond and northeast of Petersburg on a peninsula jutting out into the James River. Supplies were carried by water to City Point and distributed via rail and road to the armies besieging the two most important cities in Virginia. In mid-January 1865, Grant’s supply depot was vulnerable, and the Confederates knew it. The Fifth Division, North Atlantic Blockading Squadron under Commander William A. Parker had until recently been a powerful force full of ironclads, more than 20 ships in all. However, the recent expeditions to reduce and capture Fort Fisher in Wilmington, North Carolina had seriously reduced the number of total ships, and more importantly, the number of monitors and other ironclads in the area. Parker had at his disposal the massive two turreted monitor Onondaga, but she was the only ironclad in the immediate vicinity. Several others were near the mouth of the James in Hampton Roads, but they wouldn’t be able to react to an immediate crisis. Another measure of protection was the double line of obstructions in the James River at Trent’s Reach. Sunken ships and other obstructions were chained together to block the channel in “no man’s land” between the Union and Confederate forces facing each other on Bermuda Hundred. Federal Fort Brady, located southeast of Chaffin’s Bluff and upstream from Trent’s Reach, anchored the Union lines north of the James River, and could fire on Confederate ships, but only upstream due to a flaw in its design. Lastly, several Federal batteries, including Wilcox, Parsons, Spofford, and Sawyer, were located just back of the main Federal fortifications facing the Howlett Line, and commanded the James River. If Richmond fell, the James River Squadron’s main task would be a moot point and they would have to be destroyed, much like the original Virginia was destroyed during the Peninsula Campaign in 1862. The Confederate Navy was determined to do their part to prevent that day from arriving. The war had reached the desperate stage for the Confederates defending what was left of Virginia. And what Mitchell and his ships were about to attempt can certainly be classified as desperate. They planned to make an all or nothing sortie down the James in an effort to get to and destroy the supply dump at City Point. They just needed an opportunity to arise which would allow them to pass the obstructions in the James quickly. That opportunity came on January 15, 1865. Recent rains and snowfall had caused freshets in the James River, and the water level rose rapidly. Lt. Charles Read, in charge of the Confederate torpedo boats, observed that ice floes were moving rapidly down the James in the direction of Trent’s Reach. He assumed, correctly as it turned out, that the Federal obstructions had shifted or broken away, potentially leaving an opening in the channel large enough for the Confederate ironclads to move through. This information was given to Confederate Secretary of the Navy Stephen R. Mallory and Flag Officer Mitchell. Mallory sent for Mitchell to take immediate action the next day, but Mitchell dallied for an entire week before setting his ships into motion. The plan was for the supporting vessels to be cut loose at the obstructions, but difficulties occurred throughout the run, leading to some running aground and being cut free much sooner in the mission. The first test for the James River Squadron was the southernmost Union fortification on the long line north of the James River, Fort Brady, protecting ground taken during the Fifth Offensive in late September and early October 1864. Fort Brady contained five guns at this point, including several massive 100 lb Parrott rifles. Mitchell’s plan was to float silently past this imposing guardian, allowing the James to carry the fleet past the danger point. Alert Federals, however, spotted the Confederate ships moving past around 8 p. m. Mitchell chose not to fire at all, keeping the position of his ships more secure in the inky darkness. However, Rebel land batteries were more than happy to fire at their old nemesis across the James. The battle was surprisingly one sided…in the Confederates’ favor. A lucky shot, the second fired by the replying Confederate land batteries, disabled one of Fort Brady’s 100 lb Parrotts. In addition, the design of Fort Brady was such that once the Confederate vessels passed downriver, Fort Brady couldn’t fire upon them any longer. The first obstacle had been passed with no problem. However, Fort Brady’s fire alerted the batteries covering Trent’s Reach downriver that trouble was on its way. However, once the Confederates reached the newly open western end of Dutch Gap Canal, they hit their first snag. Virginia II ran too near shore in this area, and the gunboat Torpedo ran aground while lashed to the big ironclad’s side. The gunboat Nansemond was then cut loose to free Torpedo, but without success. Finally Drewry was also cut free, freed the Torpedo, and towed her down to Trent’s Reach under the protective guns of Battery Dantzler.